Looking at it for a few moments, I realized that comparing this sign to the common one used in the US to convey the same meaning says a lot about the eating habits of the two countries’ populations. What’s the difference? 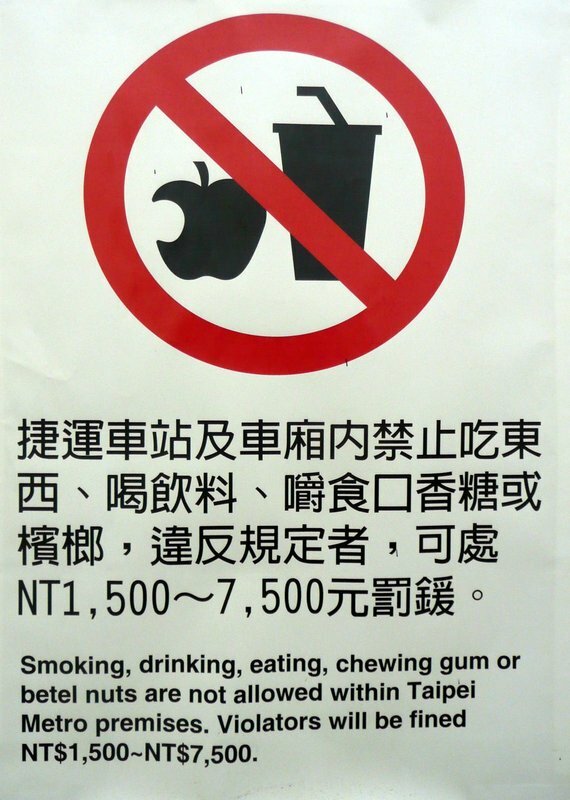 Look at the symbol used to represent “food” – in Taiwan it is an apple, in the US it is a hamburger. When it comes to relative rates of obesity, that pretty much says it all, doesn’t it? This entry was posted in Uncategorized and tagged health, Obesity, signs by christao408. Bookmark the permalink. Interesting observation; very true though. Also, apparently Americans don’t use straws either. Hmm.You know what else I find interesting, is how we find signs that say specifically “NO DURIAN”. Let’s see “no Macs” in Taipei? Very interesting observation Chris! 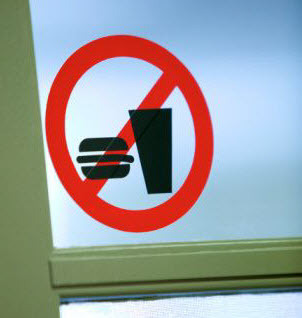 In India, we use the same sign as that of US and it obviously isn’t a representation of our eating habits. @Dezinerdreams – It would be kind of funny to find more culturally appropriate signs for all countries. Australia would perhaps have a glass of wine and some shrimps of a babeque. France would have a baguette instead of the hamburger. India? Some naan bread? Singapore would have black pepper crab, definitely! @ElusiveWords – You’ll be glad to know, Matt, that McDonalds isn’t lacking in representation in Taipei. @arenadi – Actually, I don’t use straws so that must be true. Yes, there could be a whole entry on the no durian signs, which have been appearing on the BTS Skytrain here in Bangkok just around durian season. 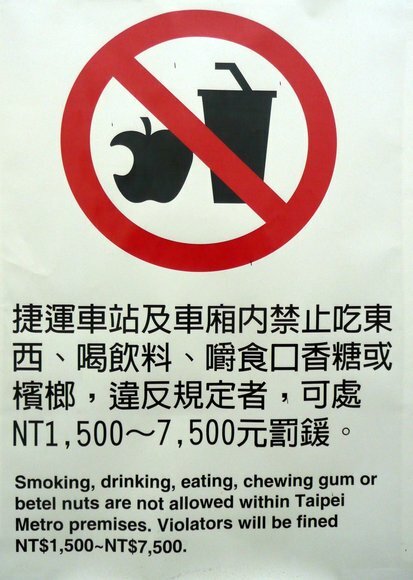 It is also worth noting that the Taiwanese sign maker took great pains to avoid any copyright infringements with Apple Computers, turning the apple bite to the left instead of the right. Whew! That’s commitment to intellectual property rights! I can certainly understand why they would ban betel nuts….lol yeach!!! And I love the comment from Arenadi about no Durian…what a stinky mess that would be!!! @christao408 – I believe that quite a few years ago, the professional baseball league in Taiwan was sued by the MLB for copyright infringement on their logo. I mean yeah sure taking a bite out of an apple is quite simple but baseball? Either hitter or pitcher right? !It doesn’t help that the three colors on the national flags are both red, white, and blue haha. Bleh. I feel fat and American after the holiday. So true!! Taiwanese people eat a lot of fruits & veggies! HahhasIve never noticed that before! Great one. That is such a good sign. How true too. Glad you posted that. Truly healthy. xanga should implement a “like” button like facebook :p this is an interesting observation! @christao408 – yeach…no thank you!!! lol and can you imagine the mess of them spitting their betel juice all over the place…lol. I do think the signs we use are a reflection of our culture to some degree. Now it would be interesting to see a ‘No Durian’ sign. Then there is the issue of the betel nut… what is it and why would you want to chew it? Wow, that does say a lot!